A dental crown, also called a cap, covers the tooth to restore its shape, size, appearance and function. The dental crown protects a weak tooth that has broken, is cracked or has a large filling. Preparing a tooth for a crown usually requires two dental visits. The first involves preparing and shaping the tooth, taking an impression and fabricating a temporary crown made of plastic. The second visit usually occurs 2 to 3 weeks later with the placement of the porcelain or metal crown. On average, a crown can last 5 to 15 years. The life span depends on the environment that you put it through. If you take care of your crown properly, it will last longer. Care involves meticulous oral hygiene and refraining from bad habits like biting your fingernails and eating hard candies and ice cubes. A crown strengthens and restores your weak teeth! 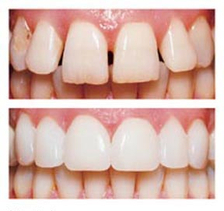 Veneers are a terrific cosmetic solution for stained, chipped, discolored and maligned teeth. Veneers are made of porcelain and can be made as thin as a fingernail. In most cases, a veneer is placed over the existing teeth with little or no removal of the tooth structure. Like crowns, veneers require 2 appointments: the first to prepare and shape your teeth and make temporaries and the second to give you a new smile! Veneers can improve your natural tooth appearance! Porcelain(tooth colored) , porcelain fused to metal and gold crowns are all available. Depending on which tooth is being restored Dr. Hill or Dr. Yorzinski will make a recommendation and discuss it with you. After your first crown/veneer appointment, you will be in a Temporary. Please take the following into consideration. Sensitivity to hot, cold sweets and pressure is not uncommon. If you feel you need a bite adjustment please call for an appointment. The size, shape and color of your temporary may be different from the final restoration. It may take a few days to get used to your new crown or bridge. Hot and cold sensitivity is possible for a few weeks and occasionally can last for months. Do not chew hard or sticky foods for the first 24 hours after cementation. The gums may recede from the veneers/crowns displaying discolored tooth structure underneath. This may take years but can be fixed with replacement. The area where the crown meets the tooth at the gumline can decay but small problems can be detected and prevented. Proper brushing, flossing and check-ups are required to retain your final restoration.